Tertön Nyima Drakpa Tsal (Wyl. gter ston nyi ma grags pa rtsal) (1647-1710) — a tertön connected with Dzogchen Monastery. He was an emanation of Khön Lu'i Wangpo, and one of the main students of the Dzogchen Pema Rigdzin, and also of Terchen Rigdzin Düddul Dorje and others. Aged 23, he took the khabjang termas from Tsari. At 28, in the Wood Tiger, he took the Tsa Sum Sangwa Nyingtik from Sring rdzong rdo rje snying rdzong. He founded stag mo sgang skal bzang phun tshogs gling in the Water Bird and Chagru Ösel sgrub sde in the Water Sheep. He passed away in the Iron Tiger. 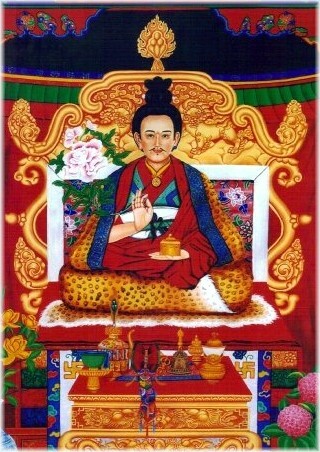 His students included Lama Kalzang Wangden, Lama Lodrö Gyatso. The former taught the second Nyidrak incarnation and the latter taught Öntrul. His other students included Hor Lochen and bka’ bcu Tashi Palden. This page was last edited on 23 March 2015, at 12:49.